The Baltimore Lithuanian Hall, also known by its Lithuanian names, Lietuvių Namai (Lithuanian Home) or Lietuvių Salė (Lithuanian Hall), is the venerable historic building located at 851-853 Hollins Street, in Baltimore, Maryland. The history of the Lithuanian Hall goes back to the nineteenth century. Lithuanian immigrants had been coming to Baltimore beginning in the 1860‘s. Lithuanian religious and civic organizations soon sprouted to serve the needs of these new residents. In 1903 one of these organizations, the Kestutis Association, acquired three West Barre Street rowhouses a few blocks away from the present location, to serve as a Lithuanian community center. But after 12 years these had grown too small for the burgeoning Lithuanian-American population in this southwest part of Baltimore City. The West Barre Street buildings were transferred in 1915 to the newly formed Lithuanian Corporation, whose mission was to look for a new location. 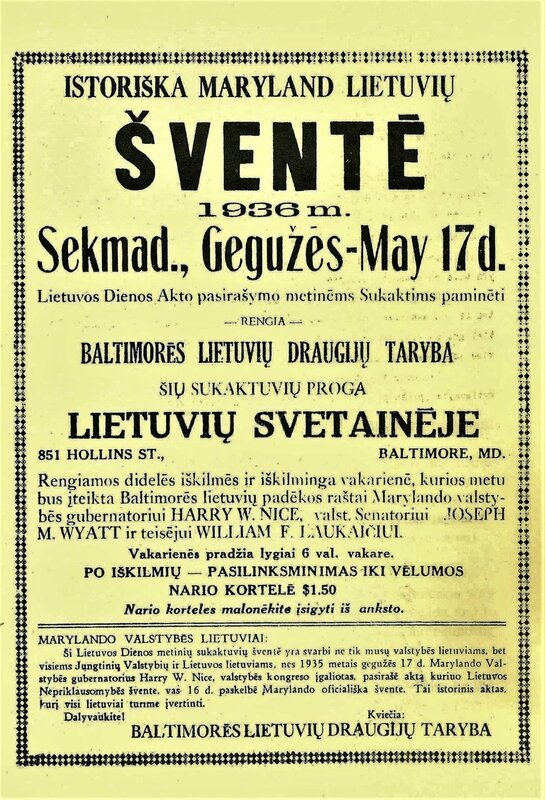 The Lithuanian Corporation registered as the Baltimore Lithuanian Hall Association in 1917, and pursued its task to establish a new facility to serve as Baltimore’s Lithuanian civic, artistic, athletic, and cultural activities center. The newly formed Lithuanian Hall Association enabled the company to overcome financial difficulties associated with the sale of shares, as a stock (or a share) could be transferred to another natural or legal person in accordance with the law. The original members of the Lithuanian Hall Association were the shareholders of the Company’s total assets, and the members were often referred to in Lithuanian as the „šerininkai“. This arrangement continued until 1977 when the Association was reincorporated as a 501(c)(3) Non-Profit Membership Organization, and the shares were converted to single, non-transferable lifetime memberships. In 1916 and 1917, two buildings on the corner of Parkin and Hollins Sts., previously known as F. Knapp‘s Institute School for the Deaf, were purchased by the Lithuanian Hall Association. These building were originally built in 1853 and opened as F. Knapp‘s Institute, a German and English academic school with 76 pupils. When the school‘s popularity grew, a second campus with a larger capacity was opened on Holliday Street, which later became the site of the War Memorial Plaza across from Baltimore‘s City Hall. Meanwhile the two buildings on Hollins and Parkin Streets became an Institute for the Deaf in 1887, when Mr. Knapp took a personal interest in helping deaf children, and felt they could succeed better at the smaller campus. These two buildings had originally been constructed by Thomas Winans, who had an interesting background as well. The son of Ross Winans, an inventor responsible for designing the B&O railroad’s first steam locomotive, Thomas Winans made much of his fortune in Russia, where in 1843, Czar Nicholas I gave him, his brother, and two partners (one the father of the artist James McNeill Whistler) a $5 million contract to supervise the building of a railroad between Moscow and St. Petersburg. During the construction, Thomas Winans and his team stayed in Alexandroffsky, a town outside St. Petersburg. Meanwhile across the street, the Lithuanian Hall Association undertook several fund drives to build a larger hall by renovating the Hollins Street structure, and expanding the Parkin St. Building to house the larger main concert Hall. To help pay for the building of the new Hall building in 1920, stocks were sold for $25,879.50 and loans secured for $47,000.00 – a total building fund of $109,116.04 was accumulated. Eventually as construction progressed, the total outlay would reach $300,000. Those loans were not repaid until the 1970‘s. Architect Stanislaus Russell was hired for the new design of the new Lithuanian Hall in 1919. Russell had designed three Jewish Synagogues, a Catholic Church in Halethorpe, and six movie theaters in the Baltimore area, as well as many buildings in Philadelphia..
After returning to Baltimore in 1850, a now prosperous Mr. Winans purchased for $52,000 thirty-five acres of what was known as the old McHenry estate (Dr. James McHenry, aide-de-camp to George Washington and the war hero for whom Fort McHenry was named, lived on a large estate north of Pratt Street and west of Fremont Avenue), and dedicated four acres of the parcel to build his version of Russian grandeur he had seen while working on the railroad in Russia. In the spot where now Little Lithuania Park stands, he had architects John Rudolph Niernsee and his partner J. Crawford Neilsen construct a lavish estate which he named Alexandroffsky. Part of the fence pictured to the left, that was built to surround the estate, still exists along the edges of Little Lithuania park across the street from the Lithuanian Hall. After Mr. Winans passed away, the estate had to be auctioned off by his surviving children, and was torn down to make way for future businesses, including warehouses and factories. Then these were later demolished in the 1990‘s and the area now makes up Little Lithuania park and a dialysis center. The actual construction and renovation work started in the spring of 1920 and was finished in the fall of 1921. The opening ceremony of the new Lithuanian Hall took place on the 17th of February, 1921 and events for that occasion continued all month. An opening banquet was organised and multiple events were scheduled. To show the versatility of the new venue, three concerts as well as a song and sports event also took place. Those opening events showed the celebrative mood with which Baltimore Lithuanians greeted the opening of a new Lithuanian Hall that they could be proud of. In October of that year, the drama play „Pilenieciai“ was performed, a five act Tragedy based on the ancient history of the founding of Lithuania, showcasing the versatility of the building to be able to put on professional theater. By 1927, during the Baltimore City bicentennial, it was reported that over 15,000 Lithuanians had settled in the Southwest area of the city, from Washington Boulevard and Pigtown, through the Barre Circle Area, along Fremont Street which later became Martin Luther King Boulevard, towards Lexington Street, west along Lombard and Pratt Streets as far west as Fulton Avenue. The greatest concentration was along Hollins Street, and that area became known as „Little Lithuania.“ So the location of the Lithuanian Hall was perfectly centered in this ethnic community. The Lithuanian Hall housed a Lithuanian Building and Loan Association, which was instrumental in providing loans to Lithuanian immigrants looking to buy homes in the area. The walk in safe in the basement of the building still remains to this day and is a unique reminder of the times, now simply used as a storage room. Also a Lithuanian National Library was opened on the main floor to allow Lithuanians to acquire reading materials in their native language. The nearby Mount Clare shops of the Baltimore and Ohio railroad were principal sources of jobs in the area. Lithuanians also provided the workforce for the huge garment industry in Baltimore. It was estimated that at one point as many as 75% of all Lithuanian Americans were employed as tailors or seamstresses. 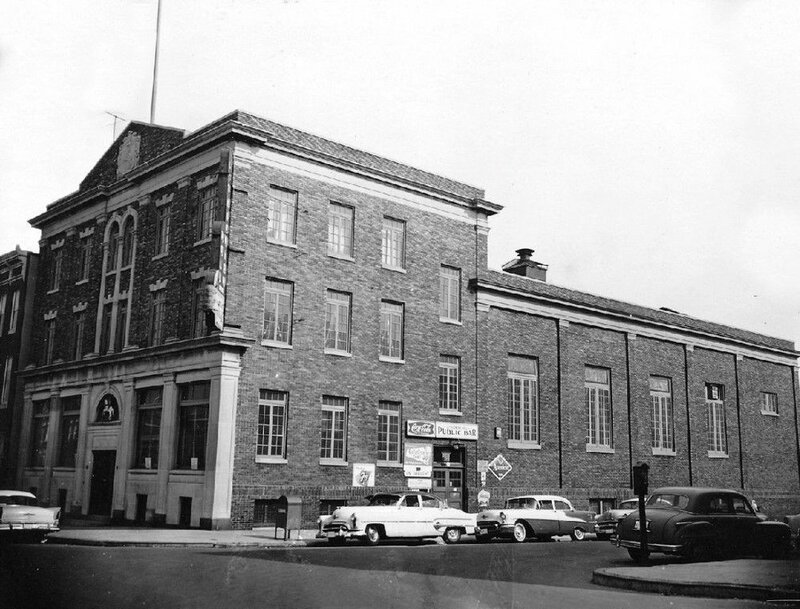 The Lithuanian Hall became a popular meeting place and convention site for Baltimoreans of all walks of life. Labor unions held rallies there, and at one point the Communist Party used the services of the Hall for its meetings. Of course when Lithuania lost its independence to the Communist Soviet Union in 1943, by then such an affiliation would have been unheard of. In the aftermath of World War II a new wave of Lithuanian immigrants began arriving in Baltimore. These were refugees from the war, who were afraid to return to Lithuania lest they be arrested by the Soviet occupiers and sent to exile in Siberia as over a hundred thousand Lithuanians had been exiled there in 1940. Under the newly passed refugee law called the Displaced Persons act, these new immigrants arrived in force, many of whom were sponsored by and taken in by Lithuanian-Americans already living here. They were known as the “DPs’” or “Depukai” in Lithuanian, an acronym of the Displaced Persons Act, and represented the second wave of Lithuanian immigration to the United States. Again, the Hollins Street corridor became a thriving haven for Lithuanian immigrants. The downstairs Maple room was made into a bowling alley, and the bar became a popular hangout after work. The main hall had a professional projection booth built on the back wall so movies could be shown there. Concerts and weddings and birthday parties were a regular draw. The American Legion Lithuanian Post #154 renovated the second floor meeting room to make it into a Legionaire‘s room for their monthly meetings where many of the World War II veterans would congregate. The fact that their home country was now occupied by the Soviet Union which had stopped almost all emigration out of Lithuania, and remembering how Lithuania was mistreated by the Czarist Russians during the previous two hundred year occupation, brought a great fear to the new immigrants that Lithuanian would disappear and become assimilated into the Soviet Union as just one more puppet state. They felt they needed to maintain the culture and art of their homeland. A museum was formed, to help teach and remember what Lithuania had been like. Lithuanian-American bands, choirs, comedy acts, travelling entertainers, singers, pianists, etc. 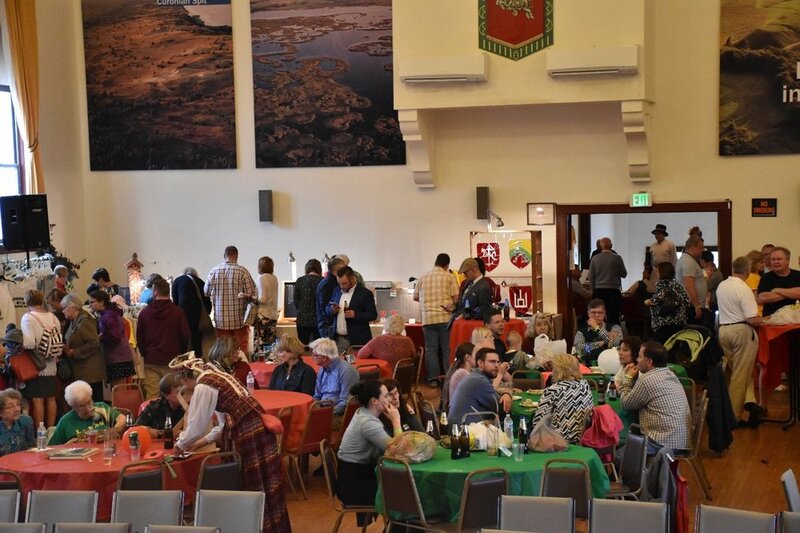 from other US Cities that had significant Lithuanian American populations, and many of which also had their own Lithuanian Halls traveled around the country, and of course would stop in Baltimore‘s Lithuanian Hall for an event. To help these new arrivals assimilate, the Lithuanian Hall helped the new immigrants to feel at home. Dinners and events were planned that fit their new lifestyle. Many of the new immigrants wanted to get comfortable with English and understand what it meant to be an American. So instead of the post World War II mission of maintaining Lithuanian culture, now it was a case of mixing Lithuanian and American culture together. The Hall was rented out to local residents as often as Lithuanian-Americans. Old mainstays like Friday night dancing were improved upon that all Baltimoreans found fun in coming to the Save Your Soul DJ nights. The Baltimore City Rock Opera and the Night of a 100 Elvises held many programs at the Hall. The Baltimore City Mayor‘s Office has held trade shows, and famous hip-hop artists have held dance lessons at the Lithuanian Hall. And of course there have been countless wedding receptions, birthday parties and Christenings, family reunions, funeral wake dinners, parties and festivals and Independence Day celebrations. Concerts and recitals are regularly scheduled. For more information, check out the reference sources below. This second wave of Lithuanians, or DP‘s, revived many of the Lithuanian-American organizations that had been waning as Lithuanian-Americans had been assimilating into American society with successive generations and losing their Lithuanian identity. Remembering their homeland, and recognizing the new suppression of their cultural heritage by the occupying Soviets, they had extra incentive to retain their ethnic identity and started many new organizations that they had participated in back home. There now were folk dance groups, a choir, a drama troupe, an active sports club, youth and senior citizen organizations, a troop of Lithuanian scouts, and religious organizations. Baltimore‘s Lithuanian Scouts planting the Lithuanian Independence oak at the State House in Annapolis. The American Legion Lithuanian Post #154 presenting the colors during a Lithuanian Independence Day celebration. Language classes for adults were formed, art classes were organized, and Lithuanian crafts were taught. All the popular Lithuanian religious festivals were upheld. A Lithuanian Radio and Melody hour that played every Sunday morning on Baltimore‘s local radio stations to disseminate news to the local Lithuanian Community was formed and held its annual talent show fundraiser every year at the Lithuanian Hall. In 1990, with the collapse of the Soviet Union, Lithuania again regained its independence. For 50 years Lithuanians were not allowed to leave Lithuania under the strict rules of the Soviet Union and the closed borders of the Iron Curtain. Now suddenly, a third wave of immigrants began to arrive in the United States, and again due to family ties, many came to settle in Baltimore. Once again, many Lithuanian-American organizations that had been declining during the 1970‘s and 80‘s received an injection of new blood. And in this sense the Lithuanian Hall began an outreach to its local community. The local Hollins Street Roundhouse Association members were invited to participate in events. The annual Lithuanian Festival which used to be held in the county in Catonsville was moved back to the city and held at the Lithuanian Hall. Many of the Lithuanian-American organizations still meet at the Hall, but it‘s not strictly just about Lithuania anymore. Now the immediate residents are invited, people from across the city come whether it‘s for the yearly Museum Walk, or the City Lights celebration. So now the Baltimore Lithuanian Hall is a community organization that serves everyone within the confines of its historic building, not just Lithuanian Americans.